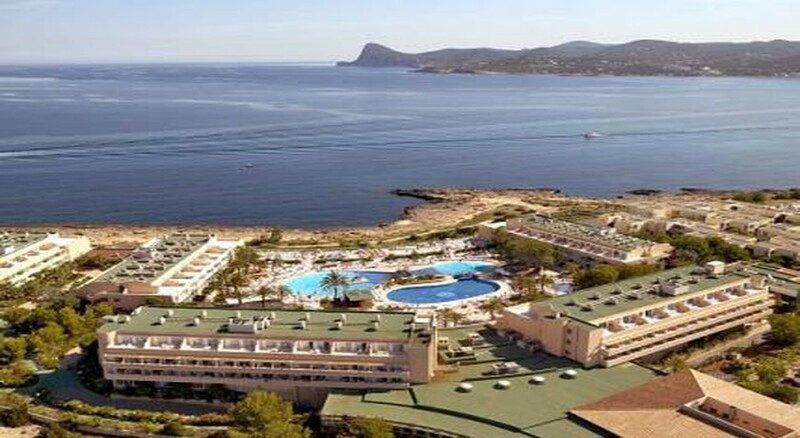 If you are looking for a relaxing Ibiza holiday, then Sirenis Seaview Country Club is the perfect place you should be staying at. Ideal for families and couples, this four-star seaside aparthotel is located at the far end of the San Antonio Bay next to the Port des Torrent beach. The establishment features 476 studios and apartments, all equipped with modern amenities that facilitate a comfortable stay. While the sea surrounds three sides of this holiday village Ibiza, a rocky beach is hardly a minute away for lovely evening strolls. The main restaurant serves buffet breakfast, lunch and dinner, complemented by three themed restaurants and an array of bars offering refreshing drinks and snacks. The Sirenis Seaview Hotel promises unending fun for its guests with plenty of leisure activities and recreation options to choose from. There are swimming pools for adults and kids, football pitch with artificial grass, multi-sport court, archery range, aerial adventure course, children’s playground, gym, sauna, whirlpool and a large water park with fun water slides and activities. Right next to the Port des Torrent beach and most of its area being surrounded by the sea, the Sirenis Seaview Country Club is perfectly located to meet all the requirements of a complete family holiday. Island hotspots, including Sant Antoni de Portmay and Cala Garcio are in close proximity to the property. There are several restaurants and cafes in the neighbourhood in case you want to walk around, on the other hand the major markets are centred in San Antonio – around 4.5 km from the hotel. There are many flights to Ibiza from all the major cities in Europe throughout the year. As the hotel is only 19 km from the Ibiza Airport, it will be convenient for the guests to board flights to and from Ibiza. Sirenis Seaview Country Club houses 476 guestrooms, broadly divided into apartments, suites and studios to accommodate guests. These rooms are spacious, modern and well equipped with air conditioning, satellite TV, safe (chargeable), telephone, Wi-Fi, furnished balcony/terrace and en-suite bathroom with bath amenities and hairdryer. For comfort and luxury, these rooms and suites also feature kitchenettes laced with microwave, fridge, crockery and cutlery. The swim-up family rooms and studios have direct access to a shared swimming pool situated right in front of the accommodation. There are a number of specially adapted rooms for travellers with disabilities. Hotel Sirenis Seaview serves international-style buffet breakfast, lunch and dinner at its main on-site restaurant La Marina. This main restaurant is complemented by three a la carte restaurants – SunSet Beach, where you can savour grilled delicacies, Cinecittà where Italian cuisine is served and Big Wave – an American diner. For your beverages and drinking needs, the hotel has a pool bar called Es Pins to ensure that your glasses are topped up while you lay down on your loungers. La Palmera snack bar and Infinity Bar prepare some of the most sophisticated signature cocktails. 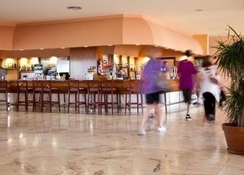 Other drinking venues include El Almirante (indoor lounge bar), El Bucanero (indoor entertainment venue), adult-only Nautilus pub and a sports bar. 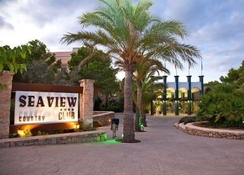 Sirenis Aquagames– the famous theme waterpark is the major attraction of this holiday village in Ibiza. You can find a variety of exhilarating water slides, jets, sprinklers, splash barrels and kids’ swimming pools. Besides, there are swimming pools for adults, whirlpool, sun loungers and sun umbrellas. The hotel also features a football ground, archery range, multi-sport court, playground, aerial adventure course and recreation room. For fitness conscious guests, there is a gym that facilitates sauna and Jacuzzi. Professional animation shows are staged daily for guests of all ages.